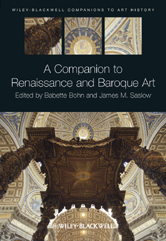 Editor/Author Bohn, Babette and Saslow, James M.
A Companion to Renaissance and Baroque Art provides a diverse, fresh collection of accessible, comprehensive essays addressing key issues for European art produced between 1300 and 1700, a period that might be termed the beginning of modern history. Presents a collection of original, in-depth essays from art experts that address various aspects of European visual arts produced from circa 1300 to 1700Divided into five broad conceptual headings: Social-Historical Factors in Artistic Production; Creative Process and Social Stature of the Artist; The Object: Art as Material Culture; The Message: Subjects and Meanings; and The Viewer, the Critic, and the Historian: Reception and Interpretation as Cultural Discourse. Covers many topics not typically included in collections of this nature, such as Judaism and the arts, architectural treatises, the global Renaissance in arts, the new natural sciences and the arts, art and religion, and gender and sexuality. Features essays on the arts of the domestic life, sexuality and gender, and the art and production of tapestries, conservation/technology, and the metaphor of theater. Focuses on Western and Central Europe and that territory's interactions with neighboring civilizations and distant discoveries.